Although the manor of Mortlake was extensive, the village consisted of just a few riverside houses on a single street until 1619, when James I provided financial backing for the estab­lishment of a tapestry works employing Flemish weavers. Charles I bought out the enter­prise in 1636. The following year the king made himself less popular by compulsorily purchasing 732 acres of the parish as part of his vast new hunting ground at Richmond Park. Later in the 17th century the village gained a sugar refinery and several maltings but the tapestry works closed in 1703. Around 1743 John Sanders founded his Mortlake pottery, becoming London’s largest manufac­turer of stoneware. Joseph Kishere, a former employee at Sanders’ pottery, subsequently estab­lished his own pottery on the south side of the high street, making decor­ative pots known as Kishereware. 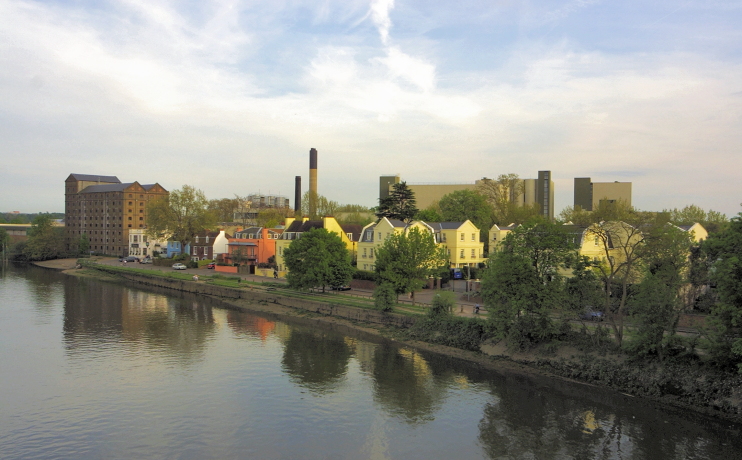 During the latter part of the 18th century, when some fine houses were being erected by the river, James Weatherstone ran a successful brewery that he extended to the water­front in 1807. The business went on to benefit from lucrative contracts to supply the British army in India with pale ale and was subsequently acquired by Watney’s. Mortlake’s entre­pren­eurial achieve­ments continued when Richard Wesley Gale later began bottling his prize honey here. The first varsity boat race was the result of a challenge issued to Oxford by Cambridge in 1829 and was rowed on the Thames at Henley. The second race was staged in 1836 between Westminster and Putney. Today the four-and-a-quarter mile course, which was first used in 1845, starts from the west side of Putney Bridge and finishes by the Ship, a 16th-century inn situated just short of Chiswick Bridge. JMW Turner painted views of and from The Limes for the house’s owner, William Moffatt. The Limes served as Mortlake town hall from 1895 until it was damaged by a bomb in 1940 and has been used as offices since its restor­ation. Shown above, Turner’s paintings are now in New York’s Frick Collection and Washington’s National Gallery of Art. A road-widening scheme spoilt the High Street in the 1960s but this failed to dent Mortlake’s popularity with home-buyers (who tend to be middle aged and in secure jobs in the Mortlake and Barnes Common ward) and by the end of the 20th century many former amenities and commercial premises had been replaced by apart­ments. Visible in the photo at the top of the page, the Stag brewery was the last signi­ficant indus­trial enter­prise operating in Mortlake, making Budweiser lager in its latter days. In late 2015 the 22-acre plot was sold to Reselton Properties, a subsi­diary of City Developments of Singapore. The historic brewery building will survive in Reselton’s resid­ential-led redevel­opment, albeit as a block of upmarket flats – visible on the right in the CGI below. 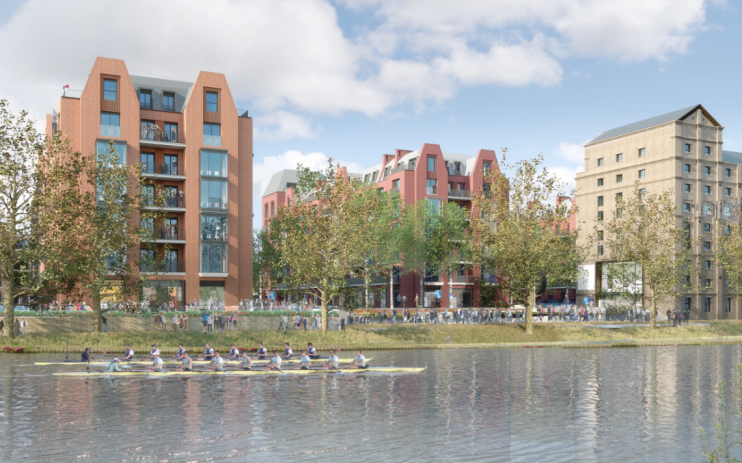 In total the site will contain at least 667 new homes, together with the inevitable shops, bars, restaurants and gym, plus a hotel, cinema, rowing club and a ‘care village’. A new secondary school is proposed, with a football pitch that will also be available for community use, as well as nine acres of green space. The ultimate value of the entire ‘regen­er­ation’ scheme has been estimated to be in excess of £1 billion. The Mortlake Brewery Community Group is displeased with the density of the planned devel­opment.